Want to drill down to see how different iPhone apps are doing? You can click around iTunes and collect your own data, or you can visit the Application Ranking section of Mobclix and see the breakdown of iPhone apps in each category. Paid apps still outnumber free apps. 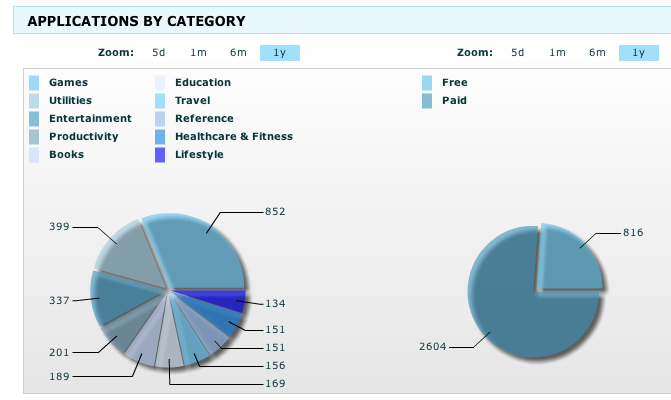 Of the 3,420 apps in the iTunes App Store, a full 2,604 (76 percent) are paid, and only 816 are free. (About the same ratio since the App Store launched). Games dominate (31 percent of all apps), followed by utilities (15 percent) and entertainment apps (12 percent). Within each category, you can sort apps by rank, price, rating, or release date. 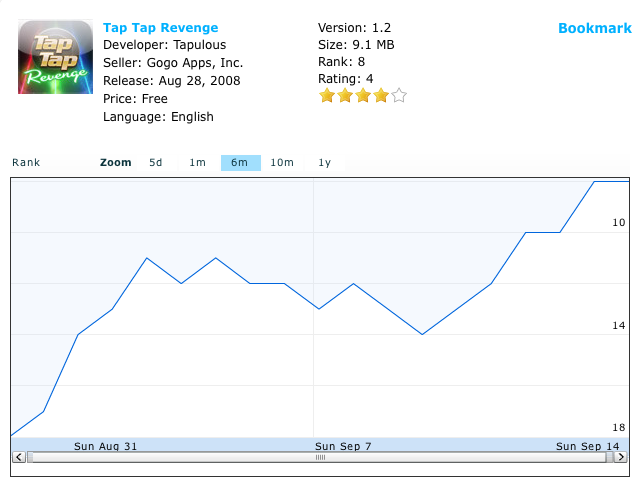 And if you click on a specific app, you will get a chart showing its rank over time—something you can’t see in iTunes. For instance, Tap Tap Revenge is maintaining its early strength, and is currently ranked No. 8. The No. 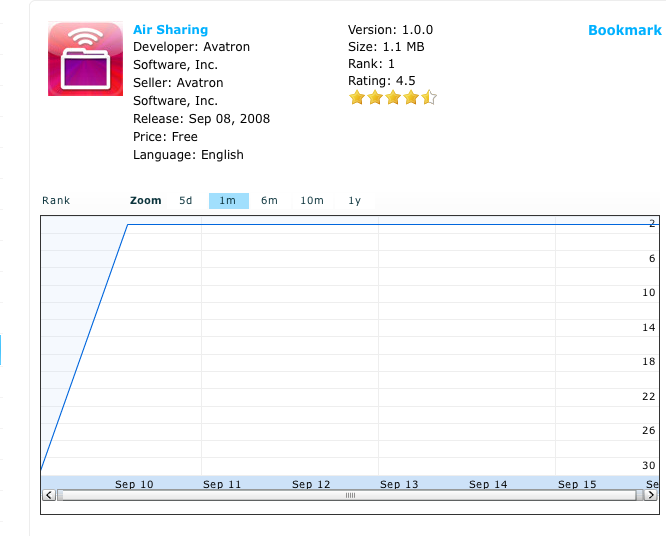 1 free app is Air Sharing (which turns your iPhone into a wireless hard drive) shot up quickly in the rankings after its launch on September 8. In contrast, the No. 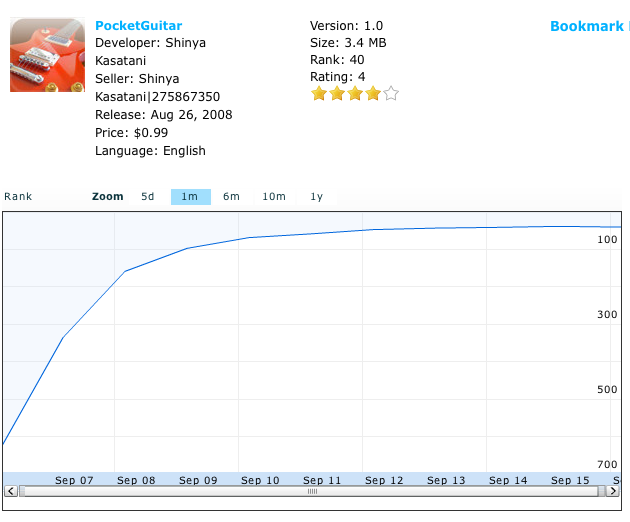 1 paid app, PocketGuitar (which turns your iPhone into a digital guitar) launched on August 26 and worked its way up more gradually in the overall rankings to its current No. 40 spot. The stats are great if you are looking at a specific app or category, but Mobclix could do a better job of letting you sort and filter apps across all categories. More aggregate data would be welcome. Mobclix launched at TechCrunch50 last week (watch its presentation here), and its main business is in giving individual iPhone app developers usage data about their apps. In that regard, it competes with Pinch Media.